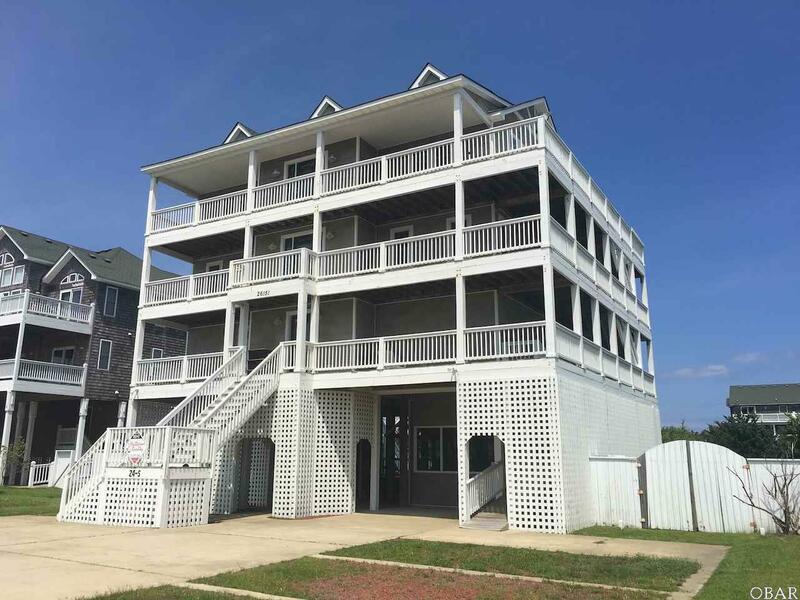 Located in Wind Over Waves neighborhood with beautiful views of the Pamlico Sound. Enjoy walks and bicycle around while enjoy sunset views from the boardwalk and pier. Launch your boat at the conveniently located boat ramp (check for depth). This seven bedroom 3 story home offers 6 Master bedrooms with their own private baths and 1 bedroom with a shared bath. There are multiple sundecks with some ocean views and breathtaking sound views. Ground Level: Ample Parking for All with Covered Elevator Entrance. Grounds Include Horseshoe Pit, Basketball Hoop, Rest Room with Shower, Swimming pool (heat available) charcoal grille and Hot Tub. First Level: One Bedroom w/Pyramid Bunk and Shared Full Bath. One Queen Suite. Laundry Nook. Game Room with Billiards, Wet Bar, Refrigerator, Dishwasher, Icemaker, TV/DVD/VCR/Stereo and deck access. Projection Theatre Salon with ultra-plush seating for 6 plus. Second Level: Four Master Bedroom Suites, Wrap Around Decks with Spectacular Views. Top Level: The Great Room Boasts Tall Ceilings, Rich Wood Laminate Floors, Tommy Bahama-style Resort Furnishings and a Full Entertainment Center with TV, DVD and Surround Sound. The Super-Sized Stainless Kitchen Includes an Island Bar and, with the Dining Area, Provides for Captivating Sound View Dining. A Half Bath is nearby along with a Wi-Fi equipped Office Nook. The King Suite has Private Deck Access and Tile Bath with Double Sinks, Master Shower and Whirlpool Tub. Great consistent rental income history. Over 11%i income ratio.